Tying the knot is very precisely applied in the Pagan world. Buy a handfasting cord for your Wiccan wedding, which unites not only the happy couple, but above and below as well. In a Pagan wedding ceremony, the couple are joined figuratively AND physically. Their wrists are tied together with a handfasting cord, as they unite in matrimony. Any old tatty bit of string would be fit for the purpose. But this is a handfasting. It's the moment when love and attraction transform into avowed commitment. It feels too special to mark with a scrag-end of old parcel twine. 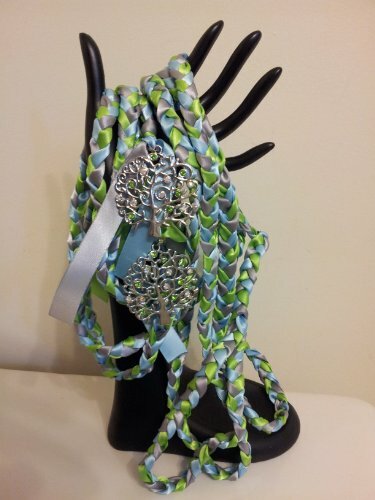 You can buy handfasting cords which really do add that certain something. This is a multi-faith concept, which means that even non-Pagans at your handfasting are likely to have encountered it. One of the most mind-blowing moments of my life came when a truth about trees was pointed out. For all that we see above ground - the soaring branches and over-arching leaves - there is a mirror of it beneath our feet. The roots are equally broad and expansive. They have to be, or else the tree would fall down through lack of foundation. Or die, because its anchors are not providing an adequate supply of nutrients to feed its towering bulk. Call it metaphor or actuality, but this is a concept not lost on the religions of the world. Especially not Paganism, with its spiritual tenets so beautifully interlinked with the natural world. The connection between what is seen, and what remains unseen, is a pervasive idea. We can touch the reality of this world, but the other becomes an article of faith. Its necessary presence is deduced, and may even be touched in spirit. (Or with a spade, if we're still going with an actual tree and its roots.) But its concealed nature mostly requires a measure of belief to discern. The Tree of Life represents a union. Perhaps the most profound of all. It channels the same powerful energy through the Other World, this world and the Nether World. What touches one, touches all. Or, as the Wiccans say, as above, so below. Moreover, the Sacred Tree is highly associated with knowledge and information. The link is there, whether it's Woden hanging from Yggdrasil in the Norse/Germanic traditions; Adam and Eve eating apples from the Tree of the Knowledge of Good and Evil in Abrahamic religions; or Celtic Druids congregating within their groves. The Tree of Life acts as a conduit for messages between the worlds. News pings back and forth, from the meanest of its cloud-scraping twigs to the most subterranean of its newly reaching roots. Wisdom is heard from the Gods to the worms, passing mortal humanity along the way. And its ubiquity in various religious faiths mean that many of those watching on will grasp that too, even if they are not Pagans. It's a nice touch which transcends creeds, just as the Tree of Life itself was never confined to just one world, one reality. It grows in them all. 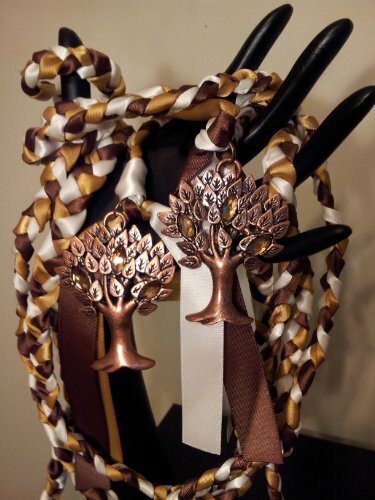 Choosing a Tree of Life symbol for your handfasting cords brings all of these ideas together. It plugs your Pagan wedding ceremony into infinity; a part of the whole, a facet of the greater story unfolding throughout all the worlds. It sends a message - a collective trunk-call, if you'll forgive the pun - to be heard by all aligned to listen. A notice of commitment posted to the seen and unseen alike. The Tree of Life acknowledges the undercurrents, and those things flying over the heads of others, which play such an important role in a relationship. Bringing together all that you are to be joined in matrimony - hopes, dreams, lust and longing, anxiety, friendship and love, responsibilities, spirituality, bravery and body too - making them part of the commitment. Recognizing the same in the person beside you, and reciting your vows in that full knowledge. Wisdom. Taking an oath to accept each facet that forms the whole being of your beloved. Each piece now part of your marriage. Unity. It was never just about two people standing in a circle reciting pretty lines. A marriage is much, much more than that, and your handfasting cord could make that point, even as it binds you. You are looking at (r-l) Lavender and Ivory Tree of Life Handbinding Cord; Copper Purification Tree of Life Handfasting Cord; and Red Passion Cord for a Handfasting. A certain similarity in the way in which the handfasting cords are displayed may have already tipped you off. They are all created by the same company. ASV Weddings hasn't provided much information about itself, but a quick internet search suggests that the owner isn't necessarily Pagan. They began with the accoutrements of Asian (particularly Indian) ceremonies, before branching out. I wouldn't let that bother me unduly. As a High Priestess, I've handfast couples before now with whatever lay to hand. There's nothing particularly spiritual about random bits of ribbon or a length of curtain cord, yet I've been known to use them in Pagan ceremonies. The handfasting cord doesn't need to be blessed outright. The wedding itself will do that. If it did require a blessing, I wouldn't entrust the job to others anyway. Your officiant will be able to take care of that according to their own tradition. As these Pagan wedding accessories have all been crafted by the same company, I can quickly explain the materials involved. Each Tree of Life handfasting cord is between five and nine feet long. They arrive in a bespoke organza bag. Though the cords differ in color, they basically conform to the same standard. 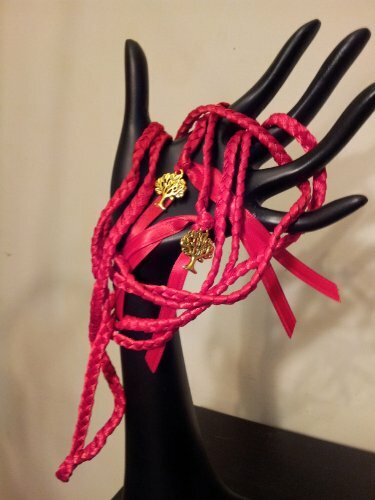 They are created from interwoven satin ribbons, which are designed not to tangle nor slip. From my point of view, as an officiant, that's an important point in their favor! (Only two major things can go wrong with the actual handfasting part of a Pagan wedding ceremony - you can't tie a knot, or you can't untie it all later. The icons are generally copper, but occasionally other materials are used for artistry or effect. Don't get too excited about the 'gold' Tree of Life pendants. They are polished brass. All of ASV Wedding's handfasting cords are very beautiful, but some have little extras which make them even more special. There's a school of thought which says that your wedding is already brimming with symbolism. The Tree of Life brings enough on its own to provide contemplation for a life-time's meditation, while managing to be utterly relevant to the rites in progress. Plus there is the fact that it's your handfasting! Everything that happens is laden with meaning. That's the nature of the ceremony for a Pagan marriage, otherwise you might just as well handfast with a shoelace, over a pint and a packet of peanuts in the local pub. But some witches (and other Pagans) can never have too much symbolism. 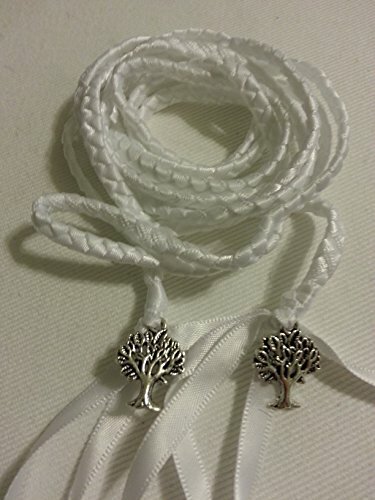 If that describes you, then there are Tree of Life handfasting cords which really go the extra spiritual mile. Let's start with the elves. Many practitioners of the Old Religion maintain a strong fairy faith (yes, I am looking at you, Pagan Celts). When the Tree of Life is buzzing, they're looking as much behind and below, as in the direction of the divine. Unfortunately there's no fey handfasting cord on offer, but there are two for the elvish faith of the North. 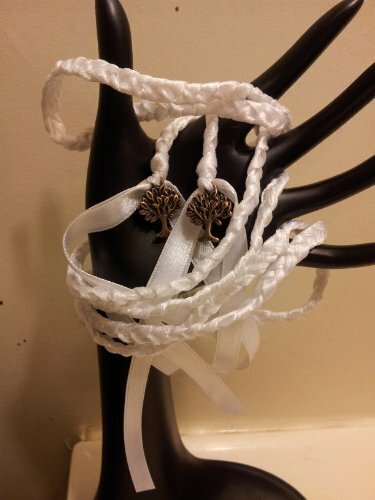 Though there's nothing here particularly elvish but the title, they are exquisite handfasting cords. Elf handfasting cords would also work well for fans of Lord of the Rings. While Pagans can handfast at any time of year, there's no doubt that Beltane is favorite for Wiccan weddings. This is the traditional Sabbat when the Lord and Lady are engaged in Their own dance of fertility. All of the natural world is brimming with energy, sprouting green and glorious in their wake. It's a marriage of God and Goddess, and what's good for the goose is good for the gander. Besides, the background in bloom looks great on the wedding photographs. This Beltane handfasting cord has been created with a view to being used in an appropriately timed Pagan marriage ceremony. There's a reason why so many Pagans are handfast at Beltane. That's the Sabbat that celebrates the Great Wedding of the Goddess and the God. Traditionally, Beltane bridal dresses are green, red or white/silver. 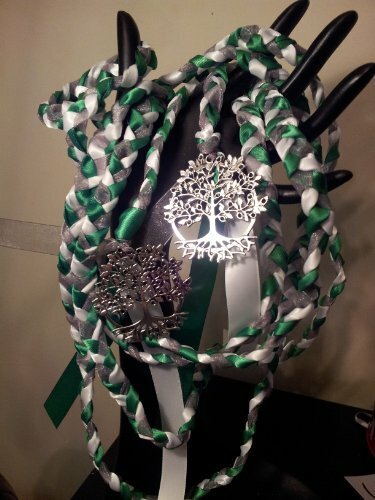 To match the Lady as a May Queen bride, you will need to don a green handfasting gown. A good way to handfast a couple who are uniting against the odds? You might have to click on the picture to adequately view it, but I guarantee that there are two sparkling rhinestone doves in those Tree of Life charms. Off the top of my head, I can think of two occasions when that universal symbol of peace might resonate in a Pagan marriage ceremony. The Tree of Life would certainly be the place to communicate peace in all realms. And I'm sure I don't have to spell out the honeymoon link to Pagans. 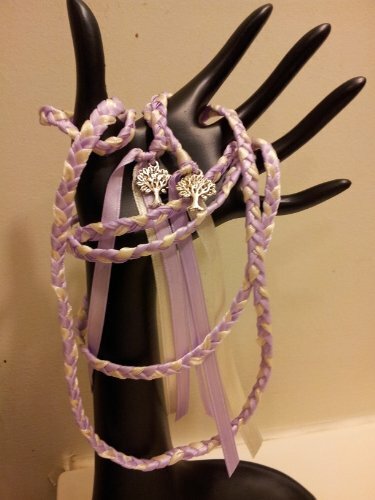 Are you looking for a unique handfasting present for a Pagan wedding? This might be an idea. It would confer instant sentimental value upon your gift! All of the Tree of Life cords for a handfasting by ASV Weddings come in a perfectly sized organza bag anyway. They will not be damaged in transit (though it's hard to imagine how they might), and can be easily stored away once the ceremony is over. But that doesn't offer the chance to display your handfasting cord when you get home. 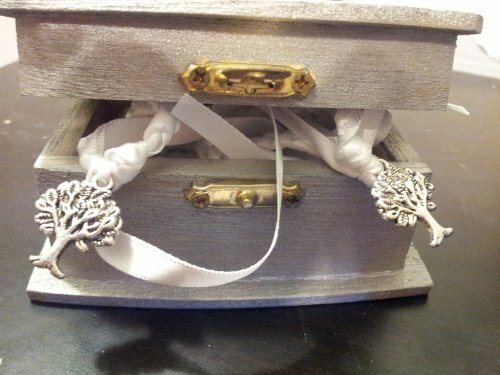 There is another option, which is to buy one of the two cords in hand-crafted gift boxes. These can then rest on a mantelpiece, dressing table or permanent altar. 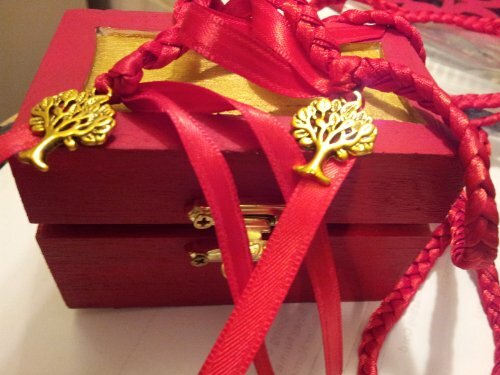 Currently, there are only two Tree of Life Pagan wedding cords available with keepsake boxes. Both of them have already featured above, but are here again with that extra touch. 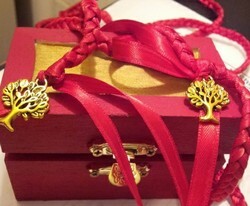 The Red Passion Purification Handfasting Cord has two highly polished brass Tree of Life pendants. They look gold in context. 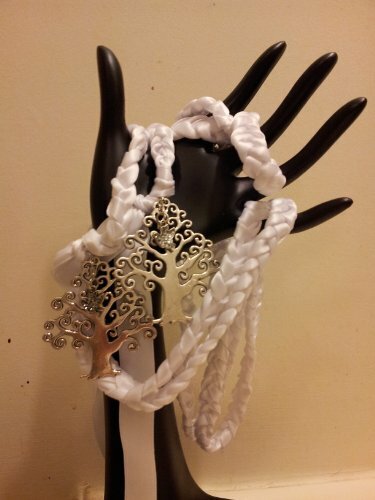 The Silver Purification Handfasting Cord, as the name implies, has silver Tree of Life charms. In both cases, the boxes are wooden and hand-painted to match the cord within. They are 4" in length, so small enough to take pride of place above your hearth. 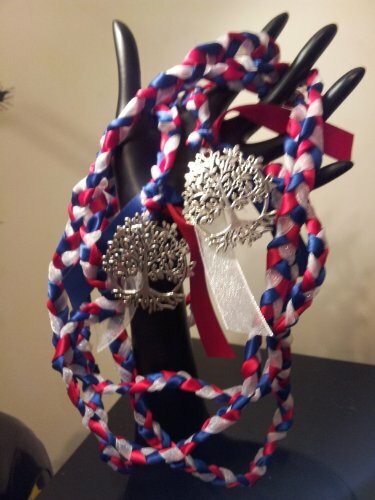 Hopefully you were able to find a suitable handfasting cord depicting the Tree of Life. It definitely appears appropriate in its symbolic meaning to me. Bright blessings upon your handfasting rites from myself and all here at Wizzley. Merry meet, and merry part, and merry meet again. Pagan wedding rites are called handfastings for a reason. Tying the cord is when the couple are joined. 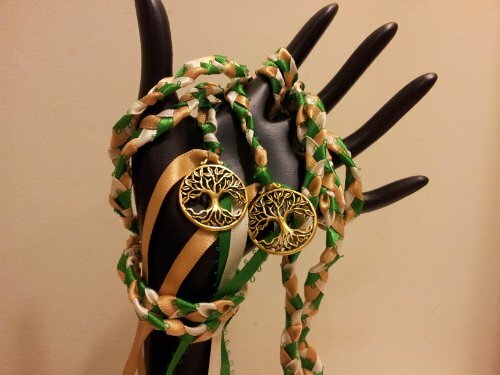 Buy a cord for a handfasting, which reflects your Celtic heritage. Running around naked and sacrificing babies or virgins are two things that will not happen at a witch wedding. Read on to find out what will! In a Wiccan Handfasting, the Bride takes on the aspect of the Goddess Herself. But where does that tradition come from? They're really cool, aren't they? The Tree of Life is such a powerful symbol. Nice page. 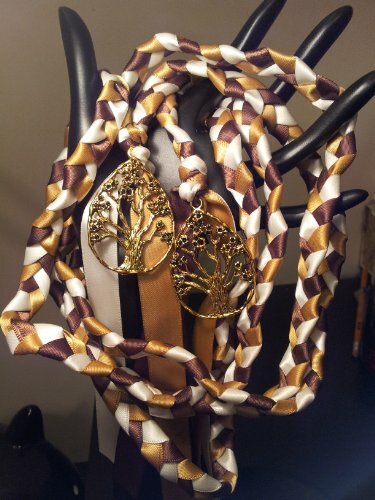 I like the idea of handfasting cords with tree of life pendants. And yes, how wonderful to see the tree of life growing both above and below the ground. It used to be Prince who was the Purple One. You seem to have stolen his crown. Saving the world from Asathnoth sounds like a very worthy reason to stay up too late. I don't know who, or what Asathnoth is, but I am glad that the world was saved. I love how 'random clean things' were all purple. I love more the mental image of what you could have gone out in. Tutu? Unicorn hat? Did you look to check if your attire was work worthy before venturing out? Just got home from work...and I have on a purple sweater, my purple laced docs, and although I didn't wear it I had brought with me my rain coat. It is purple. Also, on the floor is the purple scarf that I nearly wore but decided against, since it hasn't been cold and rain was more probable than wind. I was in a haze getting up this morning, because I had work really early but still chose to stay up til 2 am + last night to save the world from Asathoth (I am such a board game nerd XD). Also since I didn't want to wake/bug my roomie, I got up and got dressed as quickly as possible, before even making myself coffee, so I wouldn't be in and out of the room. I didn't even think once about what I was actually wearing. I just randomly put on clean things. Am I a bit partial to the color? ...I have no idea what you are talking about. Truthfully though, I don't know where it came from, I just one day noticed that all things purple were slowly invading my life. :| I would have personally said my favorite color was either blue or green before that (because they were). Whatever, purple is cool. I was hoping that you'd pop in for this exact reason. You'd be able to comment with a much wider scope on the Tree of Life. As for your question, there are bits borrowed from all over. The modern Wiccan handfasting ceremony is really a composite. There are pieces from Celtic lore, others from the Saxons and bits that haven't any antiquity at all. But then there is a core which is probably as ancient as it gets. However, there's also no dogma in Wicca, so nothing has to be set in stone for a handfasting ceremony. Some elements do prevail, like the cord wrapped around the wrists (which is, after all, the point of being handfast), but every one could technically be very different from all of the others. As one who has studied all the religions of the world [and made a point of doing so] ,I would like to ask how far the modern pagan handfasting ceremony derives from older, prechristian rituals, and/or is an expresssion of the beliefs of modern pagans, as opposed to their ancestors. Oh that's right, I did like the purple one, I remember it now! XD because purple. It is really neat how the symbol maintains the same meaning throughout different religions. The thing that I like about the Tree of Life is how universal it is, and it means roughly the same thing in most religions - wisdom and connectedness. I've always really liked the tree of life. Dunno why, but I guess it's like a connectivity to spirituality and also like a symbol of nature/life, so I was just drawn to it before I even really knew it was the religious symbol that it is. I have a thing I hung in my room that is like a cross between a peace symbol and the tree of life. It is one of my favorite things. Still think that green and silver ribbon is pretty together, is that the same color set as the one on your other article that I liked?